For 16 years, Disney and Pixar have dominated cinema in the field of animated movies. Pixar movies like Toy Story, The Incredibles, Finding Nemo and Wall-E have been both critical and commercial successes for their stunning animations and memorable characters. But what really set Pixar above the rest was their ability to translate important life lessons and interesting stories into something enjoyable for the short-attention spans of kids today and the cynical attitudes of adults as well. They weren’t just kids movies or cartoons, they were made with the quality and imagination of other grown-up movies that would earn critical praise. But, and not to scare anybody before their weekend starts, is Pixar starting to come down from their epic high of animated dominance? Their last three films haven’t exactly been given the warmest of welcomes; Cars 2 was an unnecessary mess, Brave was noble but disappointing and Monsters University was fun but unoriginal. We now have Inside Out, which Peter Debruge of Variety called, “The greatest idea that Pixar has ever had,”…….slow your roll there, guy. Inside Out follows 11-year-old Riley (Kaitlyn Dias) as she and her parents move from Minnesota to San Francisco. This is a lot for Riley to process, especially for the five emotions running around in her brain. I mean “running” literally because her five core feelings are living beings working together to make sure Riley is being Riley. There’s Joy (Amy Poehler), Sadness (Phyllis Smith), Fear (Bill Hader), Disgust (Mindy Kaling) and Anger (Lewis Black), who all present themselves at certain times in Riley’s daily life to create her personality. When Riley’s playing hockey, Joy’s behind the controls cheering her on. If there’s broccoli in the room, Disgust is scoffing at it like Riley would. But with the new house, new school and no friends, Sadness is more and more present for Riley, which does not sit well with Joy. When Sadness accidentally makes one of Riley’s happy memories sad and Joy tries to fix it, she and Sadness get sucked from the central nervous system (“central control” in this case) into long term memory. Joy and Sadness must make their way back before Riley loses all memory of who she is. Now for those who have heard that Inside Out is a “groundbreaking original concept,” let me be one of the first to tell you it’s mostly a lie. Granted the only other times this concept has been attempted is with an early-90’s sitcom called Herman’s Head and technically with the 2001 animated movie Osmosis Jones, but Inside Out is still nothing original. More so, it’s another adventure movie where the main characters get lost at point A and have to get to point B. While the base of the concept is different for Pixar, the majority of the movie is the same as previous films like Up and Finding Nemo in which two characters who are total opposites have to find a way to work together to get to where they were at the start of the movie. With Inside Out though, having Joy and Sadness have to be the traveling opposites be the two characters seemed like the easiest piece of plot Pixar has ever done, but I digress. The characters in the movie are pretty one-dimensional, but that’s expected when their entire personality is just their name. Disgust is stuck-up and annoyed at everything (just like Kelly Kapoor from The Office) and Anger wears a suit and tie while yelling at everything (just like Lewis Black in real life). Amy Poehler’s Joy is a bit more fleshed out showing signs of stress while trying to keep moral up amongst the other emotions, but it’s hard not to hear signs of Leslie Knope from Parks and Recreation in Joy. In fact, with two actors from The Office and two alums from Saturday Night Live, it’s easier to call this movie NBC Presents Supporting Comedic Actors’ Greatest Hits. While the movie may be lacking in originality and three dimensional characters, it makes up for in comedy. The banter between the emotions is enjoyable, especially Bill Hader who was born to be a cartoon character. Poehler has enough bouncy energy to carry most of the scenes with a little help from Richard Kind as Riley’s lost imaginary friend, Bing Bong. The animation is still impressive, with enough color and imagination for visual eye candy. The problem with Inside Out is that it’s now easier to see the Pixar movie formula and easier to predict the outcome of the movie. There’s the obvious message of the movie (i.e. it’s ok to feel sad and express all your emotions), but the journey to that message makes the experience as a whole more interesting. 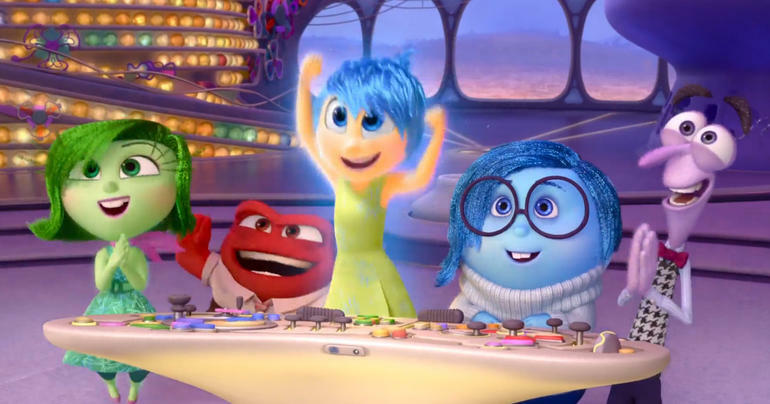 Inside Out is funny and entertaining in bits, but the movie as a whole is weaker experience. The best thing for Pixar to do would be to come up with a new journey, mainly something that strays away from formula. But since Pixar is with Disney and fears original ideas the way kids feared monsters in their closets, let’s make due with Inside Out before Toy Story 4, Cars 3 and Finding Dory ruin the films they follow by being the exact same thing. Disney and Pixar, once here for art but now here for MONEY MONEY MONEY MONEY!!!! !